Mildred Ellen Thomas Raffety was born April 22, 1932 in rural Miami County Kansas to Herbert Sherman Thomas and Bessie Belle Burson Thomas. She spent her first 12 years on the farm until moving to Drexel around 1944. She graduated from Drexel High School in 1951. After school, Mildred married her high school sweetheart Aubrey William Raffety on January 17, 1952 at Reverend Bundy’s home in Drexel. Mildred joined Aubrey in his military service living in Waco, Texas; Hyannis, Massachusetts and Fairbanks, Alaska. Mildred had numerous jobs in the early years from working at Rexall Drug Store as a Soda Jerk making “Glamour Girl’s” to selling cigarettes and candy at the Drexel Saturday night movies, working in a garment factory checking for loose threads and buttons, to testing radio parts that went into components (where she would get shocked), she also worked at a cranberry factory where she worked in an assembly line removing bad cranberries and leaves from the conveyor belt in Hyannis, Massachusetts. Once they started a family, her main time was spent caring for their first born child, Zona Marie, who was born with special needs. Mildred cared for her at home for almost thirty years, until Zona passed. After that Mildred joined her husband working on Main Street at their business Raffety’s Plumbing, Heating, and Electrical then adding in the selling of Wheel Horse lawn mowers. 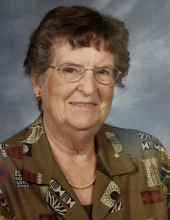 Mildred enjoyed traveling, gardening, crocheting, quilting, spending time watching her grandchildren play sports either recreational or school, supporting her “boys in blue” the Kansas City Royals, watching NCAA basketball on TV and filling out the brackets at the end of the season. Mildred was preceded in death by her parents Herbert & Bessie Thomas, husband Aubrey Raffety, daughter Zona Raffety, sister Mary Helen Jenkins, son-in-law Larry Nunn. She is survived by her brothers, Herby Thomas and wife Betsy, Drexel, MO, Jim Thomas and wife Kathy of Lee’s Summit, MO. Children - Helen Jean Nunn, Drexel, MO, Roger Raffety and wife Gerrilyn of Drexel, MO, Donna Bauer and husband Dennis of Drexel, MO, and Rachel Stasieluk and husband Brandon of Leawood, KS. Grandchildren - Jordan, Ashton and Alexis Raffety, Chelsea and Marissa Bauer, Molly and Connor Stasieluk, and Jameson Nunn and wife Christy. And great-grandchildren - Aubrey Brant, McKenzie, Cody and Alexis Nunn. To send flowers or a remembrance gift to the family of Mildred Raffety, please visit our Tribute Store. "Email Address" would like to share the life celebration of Mildred Raffety. Click on the "link" to go to share a favorite memory or leave a condolence message for the family.